I recently sponsored two ladies on a Lutheran Via de Cristo retreat. The weekend always closes with everyone gathered in a circle, singing Pass It On. I looked up the history of this well-known Christian song. Pass it On was written by Mr. Kurt Kaiser, a Christian composer who has received many awards for his music. Here is his account of how he got the idea for the song. “In 1969, Ralph Carmichael and I collaborated on a musical, Tell It Like It Is. It was written to get young people involved in the Church. After reviewing what we had written, we decided there needed to be a closer, a modern ‘Just As I Am’ [a hymn by Charlotte Elliott written in 1835, and a favorite of Evangelicals for altar calls]. This simple song has influenced many. Let the words sink into your heart as well. 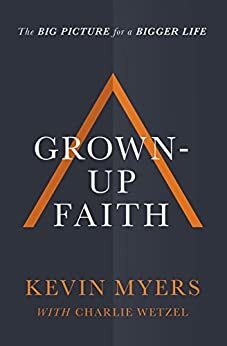 I can’t fairly call this post a book review because I started reading a book called Grown-Up Faith by Kevin Myers and didn’t finish it. Not because it’s a bad book, but simply because after the first few chapters, I didn’t seem to be learning anything new. I actually would recommend it for a small group, especially one with newer Christians, to read and discuss together. At the end of each chapter, there is a summary about “Grown-Up Faith in Action” and some chapters in the Bible to read before tackling the next chapter. These passages take the reader from Genesis through Revelation, giving a good overview of the Bible and its’ message. And it might be added, that action must spring from a correct motivation — one that flows out of a heart-felt relationship with Christ and a true knowledge of His teachings. This book gives us all something to think about. On which area am I (and possibly my church) weak? I would say the Lutherans with whom I’m most familiar, lean toward intellectualism. We know our Scripture well, but don’t always have a true hunger for Christ and obedience to His Word. We know we’re saved by grace, isn’t that enough? Well, it is and it isn’t. True grace will lead us into true relationship and true obedience. Wherever you find yourself, go one step further. Grow up in your faith. People can have an ideal for themselves, for their family, for a group, their country or even mankind. I work for a hospital. Our workplace ideal is to be the healthcare provider of choice in our county. My husband and I have an ideal, as parents, of raising our children to become responsible, productive and contented adults. A national ideal in the United States is to offer freedom and opportunity to every citizen. Our ideals can be characterized by our goals. If a person seeks a certain set of goals, her ideal will be different from someone pursuing other goals. The person whose primary goal is career advancement will have a different ideal than someone whose goal is to raise and nurture a large family. We also need the recognize the difference between the ideals we actually hold — our real ideals–and those we like to believe we hold –our apparent ideals. Too often we tell ourselves we hold a very worthwhile goal, when, in truth, the way we live points to something very different. I find my teenage daughters are very good at picking up on this tendency. We recently had a very heated discussion about why I thought they should attend our church youth group meetings. I saw my ideal as helping them to make Christian friends and grow in their faith. They felt that since they attend church and already have Christian friends, my true ideal was to look good in the eyes of others, especially my friends, the youth leaders. Know what? They were probably right. Compare your life to a boat. Your ideal — what you are trying to become–is the mast. Your personality–what you are–is the keel. These two elements determine what your life will be like. If the mast is too large, it will swamp the boat, but if it is too small, the boat will not travel as far as it could. Think about your life. Where do you direct your thoughts? How to do you spend your money? What do you do with your spare time? The answer to these questions will reveal your true ideal. Hoping this will raise some questions we can post about this month. Authors and readers, what is your true ideal? An authentic ideal is capable of satisfying a person’s every need. It is vital, providing great meaning to life. It is complete, so that we are able to live our whole life for the ideal. It will lead us to maturity. The authentic ideal must be attainable. If my ideal is to become the queen of England, I am doomed to frustration, because I will never qualify for the job. It must also be a goal or goals that are definable and understandable on a personal level. “World Peace” may be a beautiful sounding ideal, but how do I work toward it? If I have only a vague idea without clear, short term plans, I will soon become discouraged and lose motivation. The authentic ideal has a series of progressive goals which are each attainable within a satisfactory time period, but it is always able to present new goals, so that the person is continually encouraged to grow. Each goal must inspire a person to be faithful to the primary ideal, willing to give away a little more of herself each time because the results are worth it. A good ideal gives direction and meaning to life. A good ideal can help a person surmount difficulties. It can help people overcome their fears and achieve greater things than they could have before. A person with an authentic ideal does not live just for herself. She lives for something greater. She may even be willing to sacrifice herself. A person’s ideal is potentially more important than life itself. Think of the founders of our country. For the ideal of religious freedom, they were willing to sacrifice home, security, family and belongings. Many lost their lives. All the things that are really worthwhile in human history have come about due to the ideals which people have held. One of the most disappointing experiences in life is for a person to give themselves to a false ideal. Consider someone who pours their energies into electing a particular political candidate, only to have that person renege on their promises once in office. This can cause disillusionment and make future self giving and commitment to an ideal difficult. On the other hand, a person can become so cautious that they refuse to give of themselves to any other person or cause. Fear of taking a risk will prevent us from reaching our full human potential. Therefore, people must exercise careful discernment and then commit themselves to a worthwhile ideal because this is the only path to their true selves. What exactly is an ideal? An ideal is the center of our goals, it is the combination of ideas, aspirations and preferences which attract a person and move her toward its’ attainment. Another way to describe an ideal is to say a persons’ ideal is what she is headed for. It is her image of what she wants to become. The ideal has two components: vision and motivation. Vision is the foundation of the ideal–the combination of ideas, aspirations and preferences which constitute the reason for our life. It could be compared to the chassis of a car, or the framework. Motivation is the moving element, the engine. It is the impulse, the attraction that moves us toward our ideal and is based on our capacity to give of ourselves. Both elements are necessary. Without vision, we have no idea what we are moving toward. Without motivation, our ideal is meaningless, because it cannot be attained. There is no such thing as human life without an ideal. A person has an ideal throughout her life, although she might not be fully aware of it. I remember when my daughters were little girls they would say, “I want to grow up and be just like you, Mommy.” This is an ideal often expressed in childhood. Now, as teenagers, things have changed. For one thing, their ideals mark them as unique individuals. To Beth, band is life. Nothing is more important to her than the people, the activities and the goals of the high school marching band. Kate, on the other hand, is focused on academic achievement and the rewards she believes this ideal will bring her. These youthful ideals will one day be replaced with new ones related to the type of career, family and lifestyle they each decide to pursue. Every ideal my children hold as they mature will influence who they are and what they become. Their ideals will shape and characterize their lives. The higher their ideals, the more fully human they will become. Posted in via de cristo	| Tagged how ideals shape our life, lutheran via de cristo, lutheran Via de Cristo Ideal talk, what is an ideal? In spite of various limitations mature people make the effort to control and direct their own actions to meet a specific goal. Thus the goal governs and transforms a person as long as she pursues it. Everyone has a goal in life, whether they have thought about it or not. This goal governs the way that they live. The goal that each person is struggling to reach is their IDEAL. My grandfather was a person with a strong sense of his ideal. He grew up in a background of ignorance and rural poverty. His mother was illiterate. Her husband did not respect her –she was treated like a servant in her own home. The children remembered their father as a mean man who whipped first and asked questions later. They subsisted on the bare necessities of life — sometimes lunch was a lard sandwich. There were no presents at Christmas time, except some hard candy or an orange. My grandfather only went to school through the sixth grade because his labor was needed to bring income into the home. He was married by 18 with his own child to support. Circumstances like that can cause you to grow bitter, or cause you to grow better. My grandfather decided to grow better. His ideal was to have a better life than the one his family knew. He was not discouraged by his limited education or lack of a good role model. He spent most of his working life in factories, but he was not content to learn only his assigned task. He would watch what other people were doing, especially those with more difficult jobs. He would ask to be taught something new. In this way, he continually advanced himself, and ended his career as a foreman and skilled machinist. Even that was not enough. He wanted to own his own business. For years, he and my grandmother both worked and saved their money. During the evening and weekends he built the structure that became his grocery store and gas station. A better life, to my grandfather, meant more than more money, a good job, or even becoming a small businessman. He learned to treat people in a different way than his father did. He and my grandmother were always partners in their little store–when he took some spending money from their profits, she took the same. He always gave his mother $100 on her birthday and Mother’s Day–he said she never had any money of her own when he was growing up. He was a kind and gentle father and grandfather. I never saw him whip anybody. He was generous to everyone, not only his immediate family. He often gave my cousins a free fill up from the gas pumps when they stopped by. He allowed neighbors to charge their groceries and pay him on payday. He contributed to the local fire company and donated food for church suppers. He was respected in the community. My grandfather followed an ideal and it changed his life. It became his way of life. Coming next … what is an ideal….